Govt. Of Punjab Daanish Schools D.G Khan Punjab. • Minimum Matriculate or equivalent educational qualification. • Preferably 10 years related experience in a reputed organization. • Certificate in computer applications (MS Office Suite), Urdu In-Page & Typing Speed at least 30-35 wpm. • Proficiency in English correspondence/language. • Knowledge of filing system .1 record keeping. • Experience / Character Certificates from the previous employees, if any. • Minimum Diploma in Physical Education. • The minimum Provincial level player in a specialized game(s) and experienced in. • Experience / Character Certificates from the previous employers, if any. 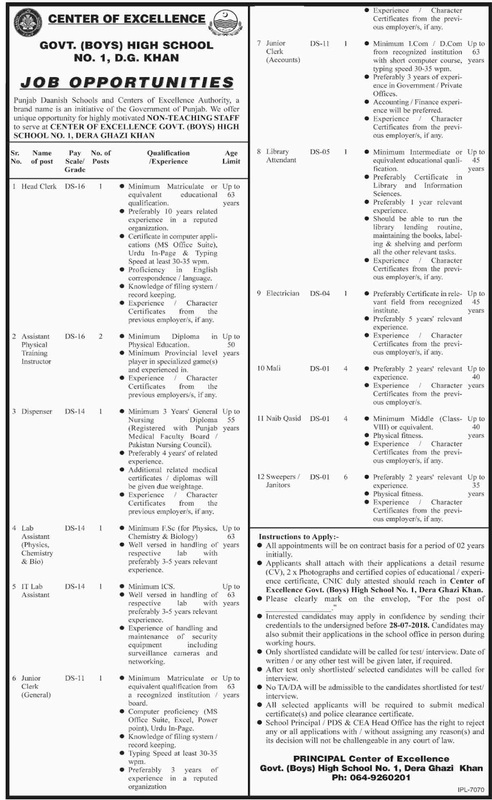 • Minimum 3 Years' General Nursing Diploma (Registered with Punjab Medical Faculty Board / Pakistan Nursing Council). • Preferably 4 years' of related experience. • Additional related medical certificates/diplomas will be given due weightage. • The experience Character Certificates from the previous employees if any. • Well versed in the handling of years respective lab with preferably 3-5 years relevant experience. Minimum ICS. • Well versed in the handling of a respective lab with preferably 3-5 years relevant experience. • Experience in handling and maintenance of security equipment including surveillance cameras and networking. • Minimum Matriculate or equivalent qualification from a recognized institution/board. • Computer proficiency (MS Office Suite, Excel, Powerpoint), Urdu In-Page. • Knowledge of filing system/ record keeping. • Typing Speed at least 30-35 wpm. • Preferably 3 years of experience in a reputed organization. • The experience I Character Certificates from the previous employer. if any. • Minimum I.Com / D.Com from a recognized institution with short computer course, typing speed 30-35 wpm. • Preferably 3 years of experience in Government I Private Offices. • Accounting I Finance experience will be preferred. • The experience I Character Certificates from the previous employees if any. Minimum Intermediate or equivalent educational qualification. • Preferably Certificate in Library and Information Sciences. • Preferably I year relevant experience. • Should be able to run the library lending routine. maintaining the books, label-ing & shelving and perform all the other relevant tasks. • Experience / Character Certificates from the previous employer's, if any. • Preferably 5 years' relevant experience. • The experience I Character years Certificates from the previous employees. • The experience Character Certificates from the previous employer's if any. • Experience / Character Certificates from the previous employees if any. • All appointments will be on a contract basis for the period of 02 years initially. • Applicants shall attach with their applications a detailed resume (CV), 2 x Photographs and certified copies of educational / experience certificate, CNIC duly attested should reach in Center of Excellence Govt. (Boys) High School No. I, Dern Ghazi Khan. • Interested candidates may apply in confidence by sending their credentials to the undersigned before 28-07-2018. Candidates may also submit their applications in the school office in person during working hours. • Only shortlisted candidate will be called for test/ interview. Date of written / or any other test will be given later if required. • After test only shortlisted/ selected candidates will be called for interview. • No TA/DA will be admissible to the candidates shortlisted for test/ interview. • All selected applicants will be required to submit the medical certificate(s) and police clearance certificate. • School Principal / PUS & CEA Head Office has the right to reject any or all applications with I without assigning any reason(s) and its decision will not be challengeable in any court of law. Center of Excellence Govt. (Boys) High School No. 1, Dera Ghazi Khan.